Usain Bolt to buy football club? Rumours have circulated today that Olympic gold medalist, Usain Bolt, has enquired to a number of English clubs about buying his own football club. It is still not yet know whether there is any substance to these rumours, however, with a number of Football League clubs in dire need of investment, should a reasonable offer be made, then it is highly likely that the sprinter will have the financial backing. Bolt, a keen supporter of Manchester United, has been spotted talking with Red Devil's chief executive, Ed Woodward, for a number of days now and has toured the Carrington training ground frequently. Despite his incredible wealth, not for one minute does anyone expects Bolt to buy Manchester United but it is believed he is merely having a number of informal chats with regards to the day-to-day running of a football club. Usain Bolt, who hails from Jamaica, won gold medals at both the 2008 and 2012 Olympic Games and has broken a number of World Records over 100 metres. ...AND SOLSKJAER HAS WON IT! Good luck with this, will be a great story. I will be following. Ziechael - Ah, I was holding my breath that you didn't have the same idea I do but luckily it looks different! I might end up using a few graphics the same, just noticed one you've used is one I have queued up for my next post haha! Olympic sprinter, Usain Bolt, has completed his takeover of Bolton Wanderers, following several weeks of rumours that the Jamaican was looking to purchase a football club. Bolt will replace Phil Gartside as Wanderers chairman and has already made his mark on the club, releasing several staff members including manager Dougie Freedman. Bolt was unveiled earlier today and posed with the Bolton kit (and his World Record sprint time) at the Reebok Stadium to the delighted Bolton fans. Bolt intends to give his first press conference as the new Bolton Wanderers chairman and owner, later this afternoon. Usain Bolt was his cheerful, charismatic self as he answered questions with various media outlets in his first interview at the helm of Bolton Wanderers. Press Officer - Mr Bolt will now be taking questions. Please note this is a strictly football related press conference and Mr Bolt will not be fielding questions about his Olympic history. BBC - Mr Bolt. Welcome to Bolton. What was it that made you choose this club? U.B. - Bolton, Bolt... Usain Bolton, ha ha ha. It was just too perfect. But seriously, they are a great team who were playing Premier League football until very recently. There's no reason we cannot get back to the Premier League very quickly, especially with the ideas I have. BBC - And being so close to Manchester United can't have been a bad draw either, I expect. You are a big fan, after all. U.B. - They are a great club, but we want to become an even greater club. Manchester United have been very kind to me over the years and it's no secret that I've had a lot of talks with them recently and I've learned a lot. TalkSport - To become bigger than Manchester United is a very optimistic goal. Who do you plan on getting in as manager to achieve that since you let Dougie Freedman go? U.B. - I know a guy, ha ha ha. Let's just say we've looked at the master plan ha ha ha. We should have negotiated a contract with him by tomorrow morning actually. SkySports - Obviously, you're a big patriot, having won so many medals for your country. Will you plan on bring any Jamaicans in to Bolton? You already have Darren Pratley and Jermaine Beckford but is there anyone else that you like the look of? U.B. - Not just Jamaica, but all of the Caribbean has an energy about it and that's what I want to transfer into this team. The samba, the music, I want us to dance past the opposition. That is my goal. We want to bring the Caribbean to Bolton. SkySports - Forgive me, but Bolton Wanderers is a traditional British club. Do you mean you plan on putting an embargo on yourself to achieve your idea? And will it affect young English players coming through the ranks? U.B. - First of all, there are several examples of clubs operating with their own embargo's, look at Athletic Bilbao, they only sign Basque players. And with regards to young English internationals, it depends. Look at Raheem Sterling. He was born in Kingston but plays for England. We can take that into account. Here we have Marvin Sordell, we will keep hold of him and he may choose to represent Jamaica in the future if he likes. SkySports - The reason Bilbao only sign Basque players is because they are in the Basque region of Spain. That doesn't really apply to Bolton though, does it? U.B. - Britain and the Caribbean have a long history, I don't need to go into that, do I? Manchester became one of the richest cities off the back of the Carribean islands, so I think we can justify it like that, can't we? Secondly, this is my club and I have decided that the vision of this club is that we will only sign players with Caribbean heritage from this point onwards. BBC - Will your current playing staff stay on? Or will they be sold? U.B. - I will allow a number to move on as I believe the potential manager and I have identified a number of key targets to bring in. Some may stay though, we will have to see. 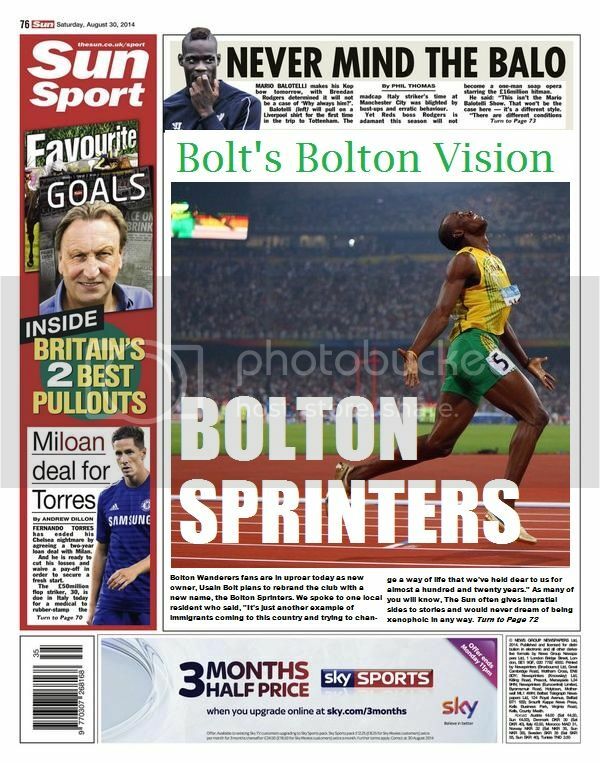 Bolton is divided today as it was revealed that Usain Bolt has submitted plans to the Football League to change the name, Bolton Wanderers to Bolton Sprinters. Bolt is also insisting that fans now refer to the team as The Samba Boys rather than The Trotters. It continues Usain Bolt's radical changes to the club after his admittance that Bolton will now only be signing players from the Caribbean. A small minority of Bolton fans hung a banner during Bolton's preseason friendly with Lincoln earlier today. Sammy Lee is currently in charge of the first team. However, a large percentage of more open-minded Bolton Sprinters supporters agree with the name change and Usain Bolt's recruitment policy, so long as expectations on the pitch are up to standard. Usain Bolt has announced the John Barnes has agreed to become the new manager of the recently rebranded Bolton Sprinters. Barnes was born in Kingston, Jamaica and while he elected to play international football for England, he did return to manage Jamaica for a brief period during 2008-09. Barnes played for a number of British clubs, notably Liverpool and Newcastle United in an illustrious career that saw him win the First Division title and FA Cup and League Cup medals. His career as a manager has seen him take control of Celtic, the Jamaican national team and Tranmere Rovers. Managing Bolton Sprinters will be by far his biggest challenge and it will be interesting to see the dynamic between Barnes and Bolt. 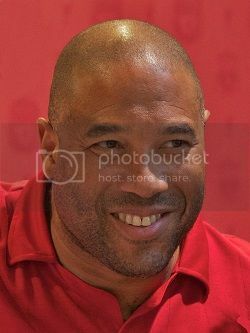 There will be a brief press conference to welcome John Barnes to Bolton Sprinters at 1 pm GMT. SkySports - John, John... Yes, hello. What was it that attracted you to this project, what is your relationship with Usain Bolt. You've been out of management for a while now, do you think you have enough experience to manage a club at this level? J.B - Hold up there, I think that you're being rude there. I've managed some pretty high profile clubs and there's nothing in my record to say I'll be overwhelmed here... In any case, the idea to get a club to the top with just Caribbean players it something I have wondered about for a long time so the opportunity to try and accomplish that was appealing to me. Usain has a great mind and is a fabulous professional, I can't wait to get working with him. BBC - Hi John, great to see you back managing again. What's your plan with the current Bolton squad, will you have to sell before you can buy? J.B - We've had people working on it for several days now. Some have been offered very handsome severance packages and others we are working hard with to find new clubs. When it comes to new players we have made several enquiries and of course we already have a few Caribbean players here. BBC - What about Tyrone Mears? It's a very known and embarrassing story to the Jamaican FA that he was called up AND capped while you were the manager despite having no more Jamaican blood in him that me. TalkSport - John, John... Over here. Yes, John... can you do the rap? Really promising start, particularly like the newspaper back page, I thought i was the only one to use them will be following this with interest! Hahah "BOLTon" Wanderers, that's priceless, good luck with your story! Ziechal - I did get the idea after reading your England FC story! But I've always liked to add my own style of graphics in my Wales story. I'm keen to see what you do with your next story! Icarus - Haha, I was looking for a London club originally in the Championship... maybe Charlton or Fulham but definitely not Millwall... can you imagine? So I went for Manchester and it jumped out at me! Also, while getting some graphics I accidentally set a picture of Usain Bolt as my background but I think I'll stick with it for a bit! Bolton have released a number of first team players as they look forward to only signing players with Caribbean heritage. Keith Andrews, Craig Davies, Alex Baptiste, Medo, Marc Tierney, Andy Lonergan and Adam Bogdan have all accepted severance packages as owner Usain Bolt and manager John Barnes have decided they do not fit with the club's long term vision. A number of youth team members have also left the club. Tim Ream, Stuart Holden, Zat Knight, Marvin Sordell, Jay Spearing, Mark Davies, Tyrone Mears, Rob Hall, Jermaine Beckford and Darren Pratley have all been retained however there are lingering question marks over the futures of the Spearing and Davies. Bolton will need to purchase several players as they are still without the bulk of a first team squad. Meanwhile, John Barnes has announced a number of changes to his training staff. Joining as his assistant and U21 Manager respectively are Russel Latapy and Dwight Yorke, both of Trinidad & Tobago. Both Yorke and Latapy have a strong understanding with one another, having played for their national team together. Dennis Lawrence, Angus Eve and Tony Warner have also joined Barnes as coaches. Barnes is also joined by several Jamaican compatriots in Jason Euell, Theodore Whitmore, Warren Barrett and Carl Brown. Former Manchester City striker, Shaun Goater, hailing from Bermuda, has also joined the setup as a youth coach. Today, we take a look at the current Bolton Sprinters ahead of the new season. Bolton will hope to get back to the Premier League, pioneered by new owner, Usain Bolt's ambitious plan to only sign players with Caribbean heritage. There are 28 or so separate footballing nations in the Caribbean with an approximate population of forty million people. Cuba is the most populated island with over a quarter of the entire Caribbean population while Montserrat is the smallest, with a population of just five thousand people. Bolton Sprinters have signed players from 11 of these islands and below we will feature a brief profile of each. We start with the nation of both owner, Usain Bolt, and manager, John Barnes (although the latter represented England in international football). There are several current Jamaican internationals who were playing for Bolton before Usain Bolt's takeover of the club, we will quickly recap them below. There was notable confusion over the heritage of Tyrone Mears. In 2010/11 he was called up and played for the Jamaican national team (by John Barnes) under the impression that his father hailed from the Caribbean island. It was later proven that Mears' father was actually from Sierra Leone, rendering him unable to take part in further competition for Jamaica. For the sake of this blog, we have included Mears' profile with Jamaica as Usain Bolt and John Barnes have explicitly stated that Mears will continue to play for Bolton for the foreseeable future. While still registered for England at this time, Sordell has indicated that he is looking into his own Jamaican heritage and if offered the chance to play for the Jamaican national team, he will look to do so. Bolton have signed a number of players individual nations that we will now look at. John Barnes has signed three players from the island of Haiti. Haiti is significant in the Caribbean with French as the dominant language as opposed to English or Spanish. Haiti also has the misfortune of being the poorest country in the Western Hemisphere. * Both Jamal and Nick Blackman (not related) are able to claim heritage from Barbados and may choose to play for the Barbadian national team in the future, something which Usain Bolt has urged them both to do. The final nation that John Barnes and Usain Bolt have elected to pick players from is the home of coaches Russel Latapy and Dwight Yorke, Trinidad and Tobago. With five players from these islands, they are only beaten to a majority by Jamaica, whose population is almost double their own. Having signed 20 players in a single transfer window (and released a similar amount) and spent close to £30,000,000 on new players, John Barnes may struggle to gel the players at his disposal. However, with players such as Jlloyd Samuel and Ricardo Gardner returning to their former club, coupled with the vast experience of Kenwyne Jones, Jason Roberts and Ricardo Fuller, there is reason to believe that Bolton Sprinters will race to glory this season. The other first team players not mentioned in this article are Zat Knight (who retains his role as captain), Jay Spearing, Mark Davies, Rob Hall and American duo Tim Ream and Stuart Holden. Wow, talk about an overhaul!! Good luck with the gelling lol although at least language barriers shouldn't be a problem... i just hope the team complies with league rules? Ziechael - Easy there mate, especially as most Caribbean countries are former colonies of England, France, Spain and the Netherlands nearly all of them have dual nationality so no work permit issues. Also, when I have so many lads who've played in England for years (Kenwyne Jones, Jason Roberts, Zat Knight etc) most have done their footballing education in the UK so have trained at British youth setups so class as HG. You are reading "Usain Bolt's Samba Boys".